There is a battle taking place in the world of scientific deer management. Some are convinced that the battle is over — that one side was clearly victorious, and that the other side, or sides, refuses to admit defeat. Others argue that things aren’t that simple, and that until all factions come together to fully consider all viewpoints, we are doomed to continue to be stymied by how to wage an even greater war involving a more pernicious foe: chronic wasting disease (CWD). 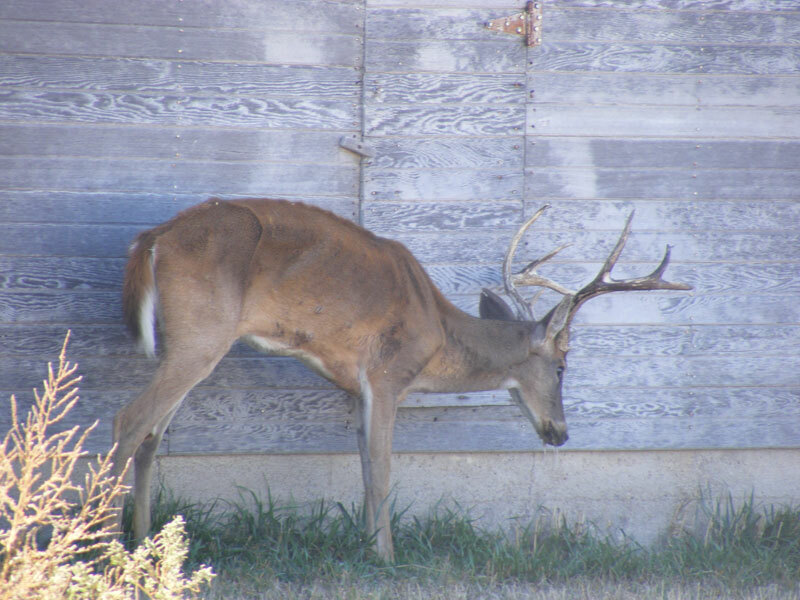 A captive buck in Kansas showing classical symptoms of chronic wasting disease, including rapid weight loss, confusion and loss of coordination. Photo credit: Kansas Department of Wildlife, Parks and Tourism. The main brunt of this war, fought among biologists and scientific researchers, focuses on how to explain the cause of CWD. This is because what causes the deadly disease has enormous ramifications for how we deal with it in the wild. If you’ve read anything about CWD, you’ve likely come across the most popular explanation: the prion theory. In 1982, Dr. Stanley Prusiner discovered the prion, a misfolded protein that he argued causes transmissible spongiform encephalopathies (TSEs), or brain diseases like CWD, mad cow disease and sheep scrapie. Today, more than 90 percent of TSE scientists firmly believe prions cause CWD. “Prionites” like Prusiner are well aware there are competing explanations for what causes TSEs like CWD. Their response to scientists conducting non-prion research has been vitriolic. For example, prion scientist Dr. Charles Weissmann dismissed others by quoting another famous scientist. Sadly, despite the fact that prion research has many unanswered questions, advocates continue to shut down alternative explanations for CWD. “There are those who desperately want to believe that chronic wasting disease is caused by something other than prions, but we know that’s just not the case [emphasis added],” said Russ Mason, Ph.D., Wildlife Division chief for the Michigan Department of Natural Resources. Prions aren’t present in 5 to 10 percent of all TSE-infected animals. Researchers are unable to grow prions in the lab, which is considered the gold standard for a scientific explanation. Contrary to expectations, as the number of prions increases, infectivity does not continue to increase, but rather drops off. Due to these problems, other TSE scientists are conducting alternative research. One is Dr. Frank Bastian, a pathologist at Louisiana State University. Bastian argues that a unique super-bacteria known as spiroplasma causes TSEs like CWD. In 2007, Bastian injected strains of spiroplasma into laboratory deer, sheep and goats. Some of the animals showed clinical signs of a TSE in just 1.5 months. One deer contracted CWD in 3.5 months, and all deer tested CWD positive in just 5.5 months. 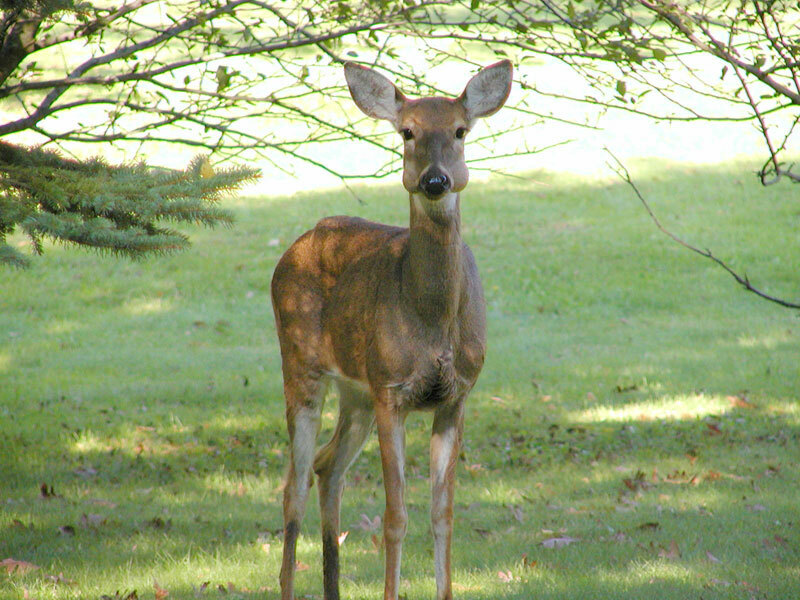 “Puffy” was one of the first deer diagnosed with chronic wasting disease (CWD) in Illinois. The whitetail is just beginning to show common symptoms of CWD in this photo, including swollen glands, excessive drooling and loss of fear of humans. Photo credit: Illinois Department of Natural Resources. So what role, if any, do prions play in causing CWD? “I think we are going to find that prions are just a marker for diseases like CWD,” Bastian said. Most recently (2017), Bastian published additional findings in the Journal of Neuropathology and Experimental Neurology, where he was able to isolate spiroplasma from the brains and lymph nodes of CWD-infected deer. What this means is that Bastian is now able to grow spiroplasma in a lab, which can have enormous ramifications for better understanding and managing CWD in the wild. “We can now test susceptibility to drugs, and produce a killed organism to produce a vaccine that can be given to animals,” added Bastian. Bastian’s research may also lead to a test kit that hunters can use in the field after harvesting a deer to determine if it has CWD. While there’s no evidence that humans can get CWD from eating infected meat, the Center for Disease Control recommends disposing of the entire carcass of a deer infected with CWD. So why aren’t scientists more willing to consider alternative CWD explanations? Perhaps the answer lies in human nature. Imagine you are a prion researcher who has spent 30 years building a career on the prion theory. What would it mean to your career, not to mention your ability as a scientist, if you suddenly found out all of your life’s work was wrong? Perhaps Dr. Laura Manuelidis, a professor of neuropathology at Yale Medical School, best summarized the war over explaining TSEs. “Those who believe in the prion hypothesis have the media’s ear, often control what gets published, and what gets funded,” Manuelidis said. Like Bastian, Manuelidis believes that the prion is not the culprit behind CWD. Given how little is still known about the dreaded disease, and the fact that state wildlife agencies have been unable to stop it from spreading, it’s high time all scientists look closely at the entire body of CWD research and follow the path that science intended. This involves conducting objective research, fully considering alternative research and collaborating with alternative researchers to better understand CWD. Unless this happens, it’s likely scientists will gain little ground on finding answers to combat chronic wasting disease in the wild.